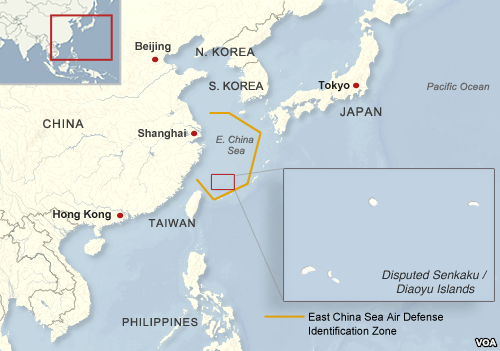 On November 23, 2013, the People’s Republic of China declared its East China Sea Air Defense and Identification Zone, which asserted expanded territorial boundaries. The new zone includes international waters as well as areas claimed by both Japan and Taiwan as sovereign territories. The Senkaku Islands southwest of Okinawa are a part of this new territorial grab. The Senkakus are uninhabited, but they are astride international navigation routes used daily by Taiwan, Japan, South Korea, the US, and other nations. Japan, Taiwan, and South Korea refused to recognize China’s claim to them. As part of the new Defense Zone, the People’s Republic of China wants all aircraft to report to Chinese controllers and obtain their permission to fly through. 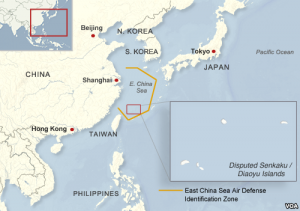 Since China declared this, the USA and Japan have responded by increasing military flights through the zone without complying with China’s request. This is their way of asserting their continued right to access international waters and airspace without having to submit to illegitimate Chinese authority. It might seem counterproductive for China to encourage resistance and distrust from its important trading partners in and across the Pacific. None of China’s Pacific neighbors, except its “allies” in North Korea, pose China with a national security threat. However, by declaring the new Defense Zone, other Pacific nations have been energized to increase their defense spending and to seek closer alliances with each other and with the US. So why set up an annoying “Defense Zone” only to have it ignored by other Pacific nations? Did China miscalculate? In my opinion, the People’s Republic of China anticipated the international reactions and accepted those costs in order to begin enacting a broader long-term strategy. China is not playing at politics for this week or this year, but rather it is focused on slowly achieving important goals during the next few decades. In that context, their feeble Defense Zone takes on a different meaning. The Defense Zone does not keep the US and Japanese military planes away, and, in fact, it attracts more of them. But in the minds of communist government rulers, it has a value in the realm of psychological warfare. For one thing, those rulers can ignore the outcome of their declaration and proclaim it a victory to their imprisoned citizens. In Japan or the US, that sort of thing would not play well, and it would most likely inspire criticism from citizens. However, we should never forget that for despotic regimes like China, the greatest psychological warfare battles must be fought at home. Since extending its imaginary sovereignty over the Senkakus, China has increased its ongoing imperial claims by occupying some of the disputed Spratly Islands in the South China Sea. The Spratlys are all closer to Vietnam, Malaysia, Brunei, and the Philippines than they are to China. In fact, in the Philippines, the sea area around the eastern Spratlys is referred to as the West Philippine Sea. When viewing a map of the Spratlys and their neighboring countries, it is easy enough to see how territorial claims for the Spratlys might be in dispute, but China is not in that neighborhood, so their claims are by far the least legitimate. The impacts of the Chinese imperial ambitions in the Spratly Islands have been fairly predictable. Important trade routes that include oil shipments to Japan, South Korea, Taiwan, the Philippines, and the US run through the waters around the Spratly Islands. Before reaching the Spratly Islands, a tanker journeying from the Indian Ocean to Japan, China, Philippines, etc., would have to navigate the narrow Straits of Malacca between Sumatra and the southern tip of the Malay Peninsula. Freedom of passage through the Straits of Malacca is important to all Pacific nations, but they are China’s most critical vulnerability. If oil tankers did not traverse the Straits to China on a regular schedule, the Chinese economy would soon be paralyzed. Since the impacts of the China’s South China Sea campaign were obvious to me, then I have to assume that they were also obvious to the Chinese, but again, they are playing for the long game. The short-term diplomatic and political repercussions are acceptable costs to the communist Chinese regime. The most obvious impacts of the newly declared Defense Zone have been the shift toward cooperation with the US by nations such as Indonesia, Vietnam and Brunei, and a refocus on US relations in the Philippines and Taiwan. From a US perspective, China’s expansionist strategy seems to require a clear and manageable response. The US government believes that the nations bordering the South China Sea should take reasonable steps to improve their military capabilities and their regional cooperation. It’s all clear and simple when viewed from the Washington, D.C. universe. The situation is more complex when viewed from the shores of the SW Pacific nations. Each of the Pacific nations has responded in its own unique way with its own unique goals and obstacles. Each of them wants to reshape its relationship with the US, and it is best that each be considered as a separate case. In our next installment, we will examine the evolving US-Philippine relationship.